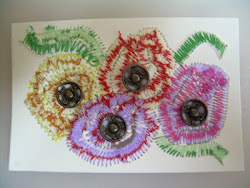 I was inspired to try something new last night while discovering a new amazing blog called Mixed Media Artist, and, I knew, on several levels, that I must give this technique a try. 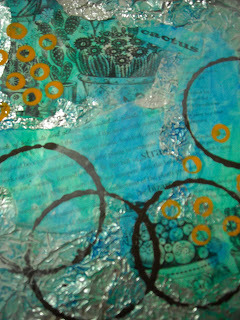 But blended together cactus papers, acrylic paints, and foil...to make something really unique! I think I like it. 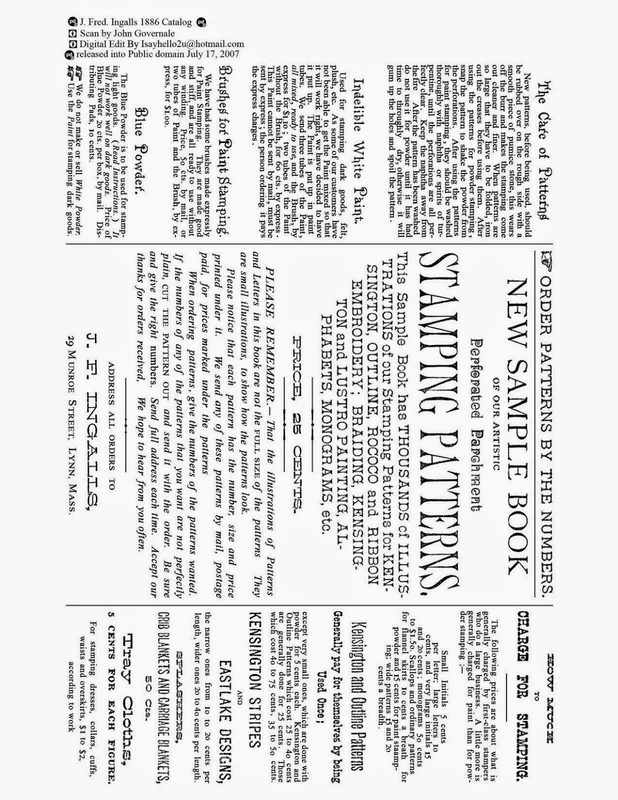 I am looking forward to trying more of this, and I hope it really gets very interesting! Wish me luck! You are a dream come true for your whole family, and we love you so much! The first year of your life has been so fun! God bless you, Emily! Love, Grandma Julie, Grandpa Dave and Aunt Carolyn! Hi all. Just a quickie note to say my little family from Germany has been hit by a virus, and they are trying to get over it but it keeps moving from one person to the next. 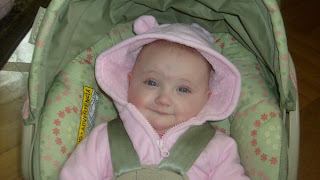 Baby now with fever too...off to Pediatrician tomorrow I imagine. I want the madness to stop...it surely isn't good for this Grandmas mental health, with all the worrying I must do! One day I will return with something interesting to say or show you, but for now, I must think about how to find 4 dressers for this family, and get them all well. Sunday is Emily Junes 1 year birthday too...I am thinking there won't be much celebrating going on...she needs rest, and loads of love from Grandma Julie! 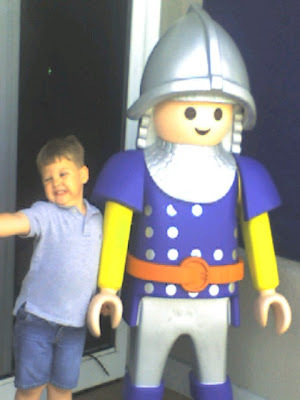 I had held captive, my two grandchildren on Friday...and we went to visit our Playmobile store and PlayPark. 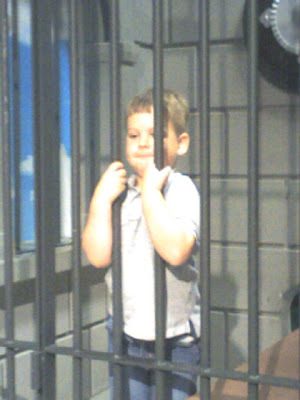 They had a fake jail that the kids could run around back and crawl into that Donovan just loved! Their PlayPark is really neat...you can play with all of the themed playsets they manufacture and they have an huge, indoor, air conditioned space with organized areas with each theme. I really enjoyed myself as well, just watching him in action and having so much fun! 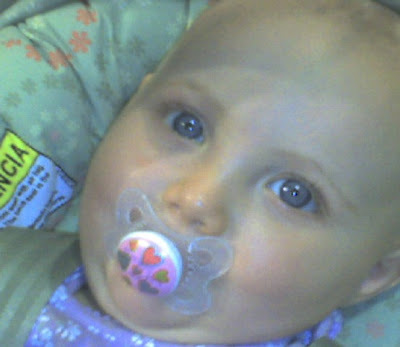 Emily was just chilled out watching everything. What a cute girl! Yesterday (Sunday), the kids moved out to their own apartment, and they started their new life together here right down the street from ME!!!! HOW LUCKY CAN I BE????? I feel so amazingly re-energized in my own life, and exceedingly happy! I am hoping the best for them...but it sure is awfully quiet around here!!! 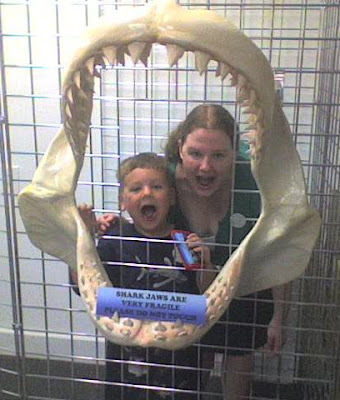 We went to a shark exhibit and got to see nurse sharks feed. It was interesting. I did not know that the reason nurse sharks got their name is that when they come up to get food, they make a very tremendous sucking sound, hence the name "nurse". Hmmm... Anyway my daugher and grandson loved posing for this pic!!! The kids are recieving both of their household goods shipments tomorrow and can get their apartment put together. It is a very exciting time for them. They have already bought a few peices of furniture and got them in there, so I suppose they just need groceries and supplies and they will be in business!!! I took my grandson for a walk around the block tonight and when we got to my Moms yard all of her sprinklers were on. I took his shoes off and and he had such a ball running through all of them! 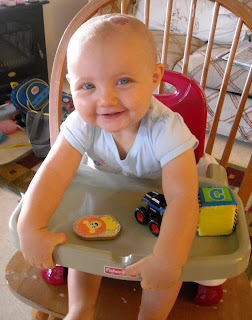 This is one little boy that NEVER runs out of energy! We came back home to pizza and he ate a peice and some ice cream and just crashed! He was so tired. Today was his second day of pre-K school and he had a better day than the 1st day. Each day will get easier once he meets the kids and starts to have a lot of fun. He participated today and came home with all kinds of stories! I started the day with needing to fix my a/c in the car. It was pouring rain. I had to end up taking a rental car at the dealership cause it was a leak in my condenser and had to be replaced...luckily my warranty covered it. They had it ready by 2pm. The rain only lasted in the morning then it cleared up nicely! 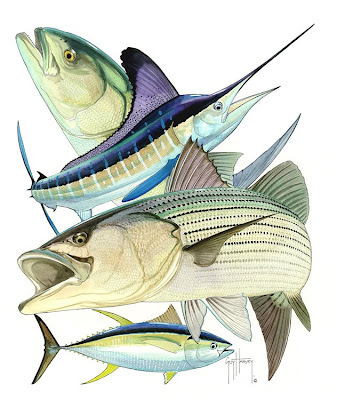 Hey have you seen the hurricane reports on Bill out in the Atlantic??? I wonder where he will end up!!! I hope not here. Keep your fingers crossed it stays out over open water and leaves!!! Hope everyone had a lovely hump day (Wednesday)! I found this in a building I went into covering for another staff member the other day and thought it was a great Cactus Monday metal sculpture to show! 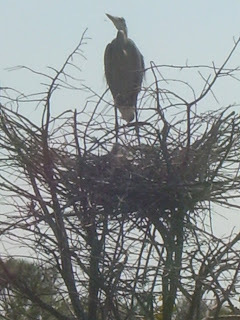 Sorry it is such poor quality...I only had my cell phone and it was also in poor lighting. 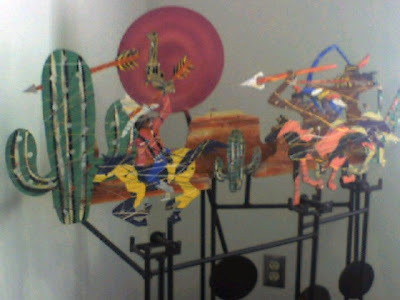 You can see the western scene with indians on horses with spears! LOL. I wish I knew the artist on this one, but I don't. 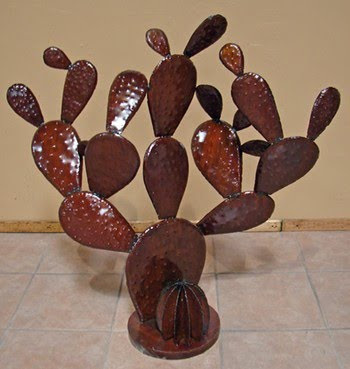 That got me to looking at metal cactus sculptures and look at what I found!!! All I can say is WOWZERS! I like this brown darn cactus! You can find this one HERE. We are staying busy here playing and having fun with the kids and grands! Donovan after shopping on a hot day! Heis a trooper! Refreshing bathtime! They are so sweet together...Donovan very tender with his sister, Emily! He loves his new hat that his Aunt Lynn and Uncle Doug gave him! 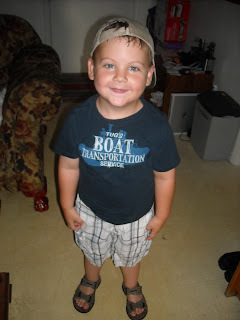 He likes to wear it backwards, but it is a really neat hat...a Guy Harvey fish hat! He has the matching tee shirt also! 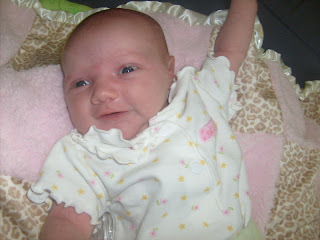 Emily June being a little cutie pie! We are just playing and having a great time with this really neat family, and we are so grateful that they are home from Germany and out of the Army, and now they can move into the next chapter of their lives! I bought myself a new colored pencil roll up case and a little Strathmore sketchbook for my purse. Of course I haven't had time to try anything yet. 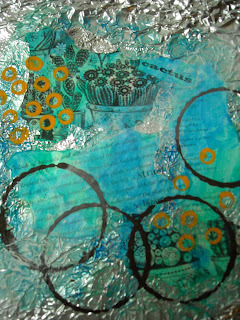 I have talked to a watercolor instructor and am looking to start a beginner class on a few weeks, on Saturday mornings! I am really excited. She is just finishing up her last class, and then the newbies start. Wish me luck! Sorry so late in posting everyone! I didn't get to post until after work, then dinner, and a walk, and, and, and...blah, blah, blah...anyway here I am at 10pm my time...and thought you would like to see a few things I took pics of on my walk tonight. 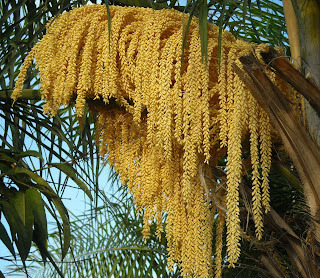 Above were some beautiful hanging seed pods (from a palm tree). Below is a very tall pachpodium...do you know which one? 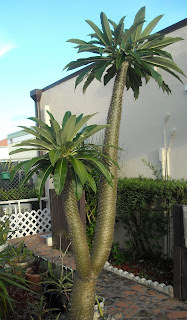 I think it is a Pachypodium lamerii. Am I right??? 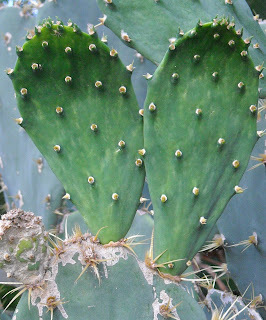 And some new growth of what looks like bunny ears, on a local opuntia. I wanted to find some that looked like Mickey Mouses ears, but these were all too tall. I have been having heavy urges to do something artistic...a drawing with pencil. Maybe by this Sunday I can give it a go. I need to find a nice place to park and have lunch outside and draw. Hmmm...I will give that some thought. Hope everyone is well. Have a wonderful week! OK, in asking the family what a good name for my Fresca Robot (last post) should be named...my daughter hollered out from the back room "SPLENDY"!!!! This is what I always accidently call Fresca. I have no idea why. I also use Splenda regularly, and call it Splendy...so I must say that this just HAS to be his name! Ha ha ha!!! Yesterday while I was working, my son, and his family and my daughter all went to the science museum. They had a good time and bought a few things at the gift shop. One of them was for me! They saw this kit that let's you build a robot using a soda can. They thought of me, since I love Fresca..and when I got home from work they presented me with my very own Fresca Robot! It "walks" standing up straight OR on "all fours"!!! 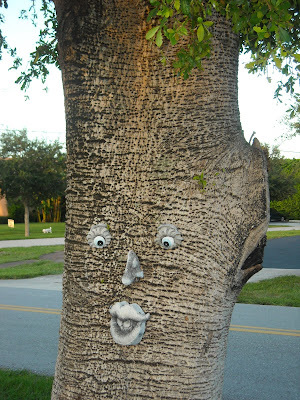 I think it is adorable...sort of bug-like...what do you think????? It would be really great if it could deliver me a Fresca to the couch and then give me a footrub! Is he doing a "moon walk"???? 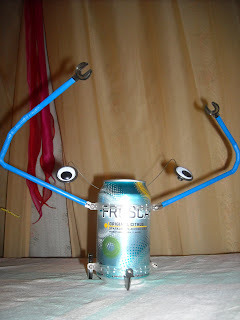 You are one groovy robot, Mr. Fresca Robot!!! Keep on keepin on!!! 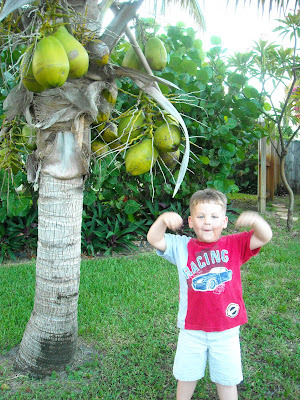 Yesterday my grandson (Donovan)and I went for an adventure walk around the neighborhood, and he got to discover coconut trees! He wanted to be a monkey under them! 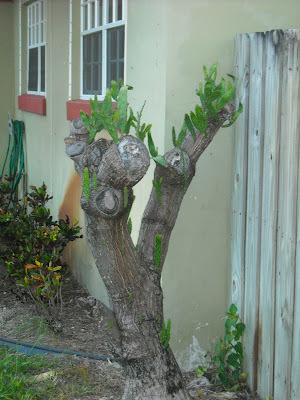 Here is what is happening with the cut down prickly pear tree...it is coming back vigorously! 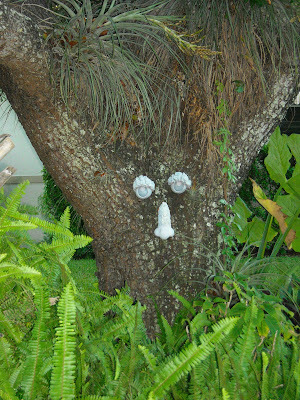 Then we discovered a few friendly faces in the trees! Then we walked back home to find a blissful baby (Emily June) in the arms of her Daddy! 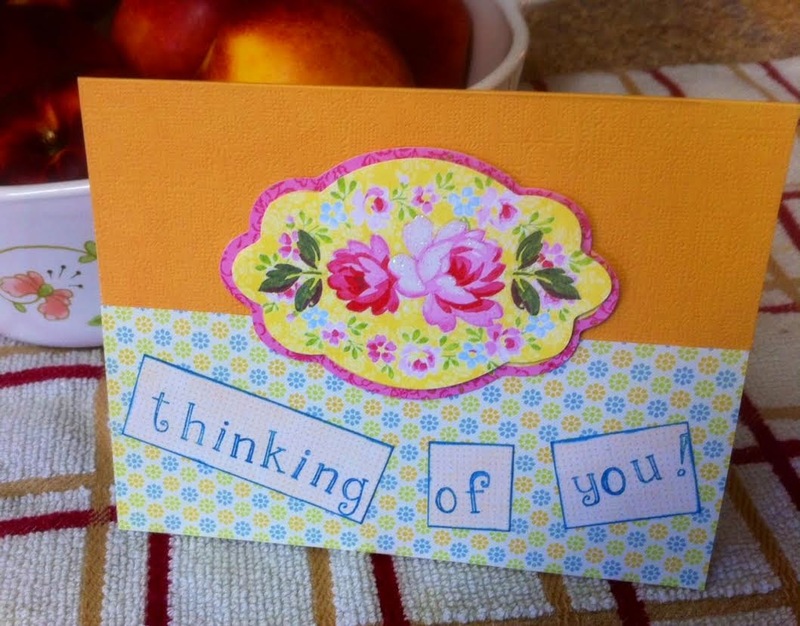 Hi to all my blogger peeps!!! I sure have missed reading your blogs and playing with you lately! The grown kids just went out to lunch and took the grands with them, so my husband (with the excruciating heat outside), is playing the Wii Tennis game, and doing very well while getting a workout at the same time. I am happy to see him playing something other than the game he has played for the last 100 years (*not really, but it seems like it, LOL), called Pokemon Puzzle League...he is a master at that, and got addicted to it *100 years ago and has never stopped. With that you are not up moving around though, like when you play the Wii. 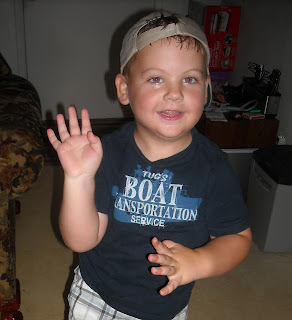 My grandson is extremely competitive, we have found out...he is one tough little 4 year old. I am so happy he loves playing the Wii inside, because it is unbearable outside. It will be so wonderful to feel the first day of Fall air!!! My husband had a milestone birthday yesterday and my son grilled his Freedom ribs, which he perfected while in the Army! They were fantastic...oh man...fall off the bone, tender with a sauce on them to die for! He also made us grilled corn on the cob, which is always great! It was a perfect summer Happy Birthday meal! Had my Mom, my SIL, and my friend Karen over...so lots of fun! I am going to try and do a Cactus Monday post later tonight if I can...but only time will tell. We are attending a funeral this afternoon and early evening, so I suppose it will just depend on if I can get 'er done! LOL. Hope everyone is well, and I will be seeing you again soon!